One of our most popular and highly sought after oak flooring series is the French-inspired ÉTENDU series. Explore our inspirations below to make your bath time experience one that you’ll enjoy at home, including the use of dark wooden floors and motifs. Installing a high shelf above the bathtub that’s mainly out of reach creates the perfect space to put accessories like antique jugs, candles, jars, and even small plants. By keeping it high up, you aren’t taking up space you need for other things, and you’re creating a central visual focus. Ideally this shelf sits directly across the room from the entrance, at just-above eye level. By keeping your floors a neutral leaning or dark, you’ll be able to enhance all of the details in the bathroom — and make the tub and sink pop out. We recommend using Sienna wood, Verona, or an even darker Genoa to create the contrast needed for a rustic country style bathroom. Keeping the ceramics in the bathroom a simple, crisp white means a perfect contrast with wooden floors, and emulates a French country home. Using traditional taps and a bath with clawed feet are great ways to enhance the rustic look. Above the sink basin, hang a light wood framed mirror to create simple lines across the wall. You can either use a simple frame, or one with carvings around the edge. Why keep your walls bare? Get a sophisticated look and some eye candy by either painting or hanging wall decorations focus on lattice or rounded shapes. White walls with one accented colour help bring in the light and create a spacious look, even if your bathroom is small. You can also use the window as an opportunity to feature a design. By using stained glass or intricate grilles and bars, you can create a bold shadow across the tub or floor. This is a bit trickier to do, and is recommended for second storey bathrooms for privacy and optimal lighting. By installing a solid cabinet under the sink with a muted green or blue hue, you can easily match your wooden floors and white basin. It will also catch the light well, and the subtle tones will not be too abrupt or look dirty easily. 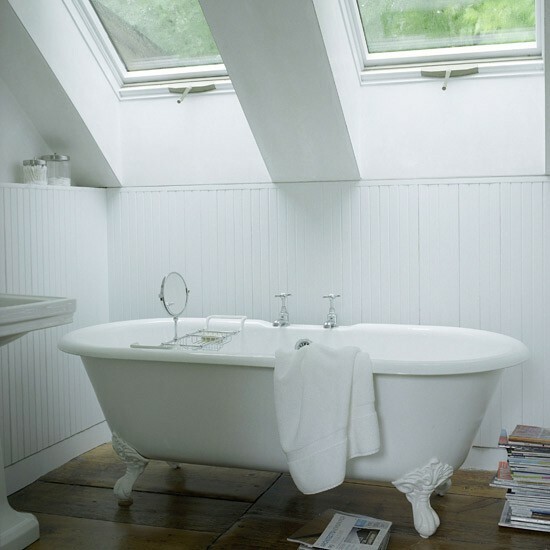 Installing a skylight that sits directly above the white ceramic bathtub is a great way to instantly bring extra space and light into the room. By reflecting on the white tub or the water, the light will increase from a focal point – illuminating the floors and creating hidden spaces in the corners. For more French Country Bathroom design ideas, view our Inspiration section. Find your nearest Wildoak retailer to get started on your French-inspired design.